It’s an exciting Thursday over here! First , after a flurry of text messages this morning between me and some of my girlfriends we decided “you only live once” and bought tickets to a sold out Mumford & Sons concert in two weeks! The concert is on a week night, an hour and a half away and we way overpaid for the tickets but we decided the experience was worth it. I have been dying to see them for years and they’re one of the few of my most favorite bands that I haven’t seen live. I can’t wait. It’s going to be an awesome evening! And second, my new handbag was waiting on my doorstep when I arrived home for lunch. I am not a big shopper and when I do shop it’s usually at Target or Nordstrom Rack but last Sunday I decided that I was finally going to buy myself a nice purse after wanting one for a really long time. I chose a neutral gray but a fun purple wallet. So happy with my selections! The Greek yogurt gives it a good tang, the banana balances it out with some sweetness, the dates give it sweetness and texture and the almond butter gives it staying power. Yum! Lunch yesterday had a Thai spin on it. Red curry coconut chicken soup and vegetable spring rolls with peanut dipping sauce. Lunch today was a little more basic. Open faced turkey sandwich with herb mayo, avocado, heirloom tomatoes and muenster (I had flashbacks to when I used to eat open faced sandwiches all the time) along with mango and these weird gluten free hummus chip things that aren’t really that great. Dinner last night was my favorite salad combination as of late. Mixed greens with goat cheese, pecans, dried cranberries and avocado topped with broiled salmon heavily seasoned with salt and lemon pepper. The salmon was wild caught from Alaska and I got a great deal on it at Whole Foods. Off to tackle my inbox and to do list. Both are frightening! The Thai looks delicious! Where did you get it from? believe it or not…reid’s! they do themed stuff every week and this week was asian. I’m going to the same show! I’m so excited!! 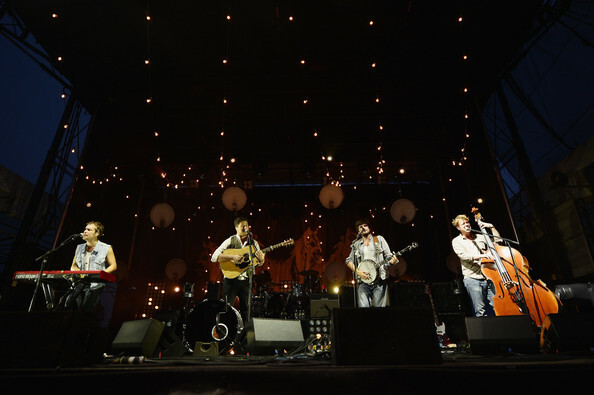 I saw Mumford & Sons when they came to Chicago for Lollapolooza a few weeks ago and they were AMAZING live. Worth every penny and sleepiness the next day. You won’t be disappointed that you decided to get the tickets 🙂 Have fun! This post has so much deja vu for me! I’m going to the same Mumford & Sons concert AND I just bought that exact same purse! I just felt like I was reading my own blog post! Enjoy the new purse; I love mine so much. charlotte…that is such a crazy coincidence!!!! can’t wait for the concert and loving my new bag already! Love Mumford sooo much!! Very jealous! And the smoothie looks fabulous! this makes me SO excited. our tickets are general admission too but they’ll be worth it! I bet the concert will be totally worth it!! How fun! That open faced sandwich sounds delicious. I LOVE muenster cheese! me too! especially in grilled cheese! LOVE the purse and wallet! Great choices! Super random question – but where did you find your plates? I absolutely LOVE the design, and would love to find something similar! Ahh, that’s awesome! I think a Mumford and Sons concert would be so much fun. Love that purse and wallet – so cute!! I am SO jealous of your Mumford tickets!! I just watched their Red Rocks show on a random TV channel the other week and it was amazing. Also, love your wallet and purse! Kate Spade has such adorable and fun merchandise. I would have to agree with you that goat cheese, pecans, and dried cranberries is an amazing combo on salad. Top it with delicious salmon and you can never go wrong. Have a blast at the concert. Love them! Good Luck getting through the “to do” list, before the weekend. Hopefully you will be disconnecting a little bit. unfortunately i’ll be connecting as i have to launch two websites but at least i’ll have some downtime to focus! I’m in a similar Mumford situation–I’m seeing them an hour and a half away on a weeknight. It will be so worth it!! My fall is completely packed with bands I’ve been waiting to see for long, long time. I can’t wait for the next few weeks. Have fun at the show! i’m not regretting my decision at all. will be SO worth it! i cannot believe i’ve never seen them! I saw Mumford last year at Red Rocks (it was actually filmed for the Road to Red Rocks documentary they did) and it was literally one of the top two shows I’ve ever seen! I had seen them the year before at a smaller venue in Denver, which was also amazing. I thought they were going to be a little too “quiet” for Red Rocks, but they killed it. Whenever I get the chance to see them, I jump at it, so I know you are going to have a blast! that’s awesome! i’m so excited. i would kill to see a show at red rocks. what an amazing venue. i can see them bringing it there! I want to begin incorporating more smoothies into my diet, but we have the worst blender in the world that can’t blend anything and a new one is not in my unemployed budget – maybe someday soon! Keeping fingers crossed a job will come my way! smoothies are THE WORST with bad blenders. that’s why i make them at work with the vitamix. it takes me 5 minutes to get them blended halfway decent at home. You will not regret the price of those tickets! Just saw Mumford perform while they were here in Ontario, and they were amazing! Enjoy!! not regretting it at all. so excited and going with such fun friends. will be amazing! Have been to a few of your yoga classes and have been reading your blog for several years–you rock. First, Mumford and Sons is definitely a concert worth the splurge. Second, I have a similar Kate spade crossbody and neutrals are the best, they work with everything! And kate spade makes good quality leather products. I rarely comment on blogs, but you just seem like you’re recently invigorated and I’m happy for you. Cheers. thanks so much for the kind comment maggie! happy friday! LOVE the purse! Also, I am going to have to try dates in my smoothies…do you put them in for added sweetness? How does it effect the consistency? Do they get pretty chopped up? i put them in for sweetness and texture. they do get chopped up in little pieces but definitely not pureed. i use a vitamix at work. not sure how they would do with a standard blender. i got the idea from whole foods! I use dates in my green smoothies as well, using a Magic Bullet to blend. They add a nice sweetness but usually do not get chopped much (if at all). Enjoy the concert! I adore your new purse. Kate Spade purses are my favorite, and that means something since I’m not a huge shopper either. Looooove Kate Spade!!!!! So cute. Just catching up on your posts now! I’ve seen Mumford and Sons twice (the second time was on Tuesday!) and you will not regret those tickets!! We had tickets in the “pit” section, and we were worried we’d get trampled. Not so with the Mumford crowd! No crowding, plenty of space, and a great experience. Enjoy! !